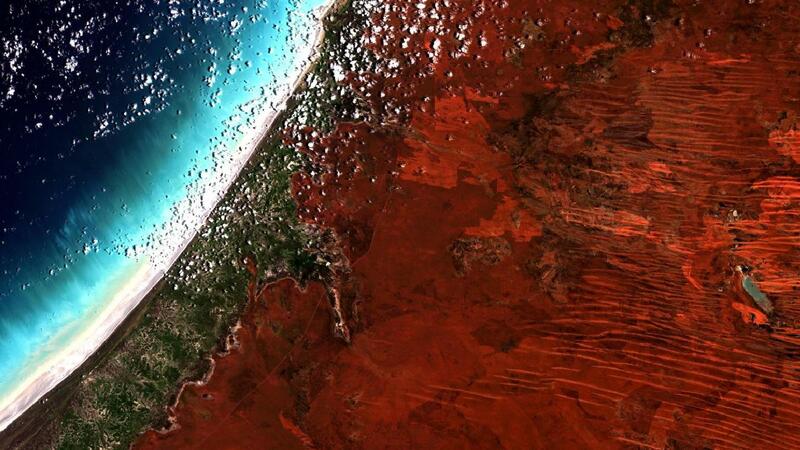 The satellite image of the month July shows a true color composition of the “Eighty-Mile-Beach” on the west coast of Australia. The image is based on Sentinel-2 data of the Copernicus program. Sentinel-2 data are multispectral satellite images which are free to obtain. After downloading the scene an atmospheric correction was carried out with free software and a color composite was calculated using three different spectral bands. The picture shows a very characteristic landscape for Australia: in the left half of the picture the white coastal strip as well as a section of the Indian Ocean runs through, while in the right half of the picture the characteristic rusty brown earth marks the so-called “Great Sand Desert”. Some individual small clouds seem to be pushed from the sea into the desert, but they provide hardly any shade. A narrow strip of sparse vegetation runs parallel to the snow-white beach and covers the otherwise very barren landscape of the Australian west. The Eighty Mile Beach is an area about 220 kilometres long and 100 metres wide, located between the Western Australian cities of Broome and Port Hedland. The wetland, protected by the Ramsar Convention and of international importance, is one of the most important wading bird sites in Australia. Large parts of Eighty Mile Beach are traditional Aboriginal property and are used for ceremonies or narratives. The Great Sandy Desert, connected to the Eighty Mile Beach, is a 267,250 km2 desert which is very sparsely populated. In the Great Sand Desert, before European colonization, the Aborigines lived nomadically as hunters and gatherers. The landscape is characterised by sand plains and dunes. In Western Australia, the up to one hundred kilometres long dunes extend in a northwesterly direction and in the Northern Territory in different directions, which are also much smaller there. The climate in the north of the desert is tropical-arid and the further south it reaches, it is tropical-moderate. Rain only falls during the monsoon in the summer months, especially in the north.